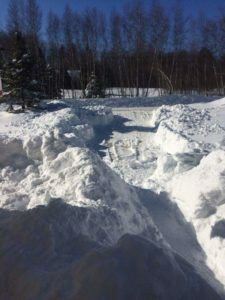 BANGOR, Maine– The weather in the week preceding Valentine’s Day had been unkind to the residents of Bangor, Maine. Beginning lightly that Tuesday morning, snow began to drift down and cover roughly an inch or so of ground. The weather worsened early that Wednesday morning, when the light snow evolved into heavy sleet and ice fog, which threatened to cancel or delay classes at Husson University. Students were disappointed when no such outcome occurred, however, and many students were late or failed to attend class. After changing into freezing rain during midday, the storm fizzled out and all was clear in the skies, until that Thursday afternoon. After a relatively clear morning, Thursday afternoon saw near-sleet coupled with winds whipping the trees around the Husson campus. The view from the massive windows in the Dickerman Dining Center in the evening was just a deep blue, with the snow obscuring the details of the campus landscape. Classes at Husson University on Thursday were cancelled after 12:30pm, when the storm began to pick up. Nearly a foot in snow from those three days had accumulated, despite the best efforts of the maintenance staff, who plowed and salted the pathways around campus in the early hours of that morning. That Friday morning, students continued to have trouble attending their classes due to the weather conditions. “It took me three hours to drive here,” said Natalie Scott, a Journalism student at the New England School of Communications. Students living on-campus even encountered struggles walking to class, with slippery and icy conditions covering the campus walkways. That weekend also failed to bode well for Husson students: a further sixteen inches were estimated to fall over those next three days, encapsulating the weekend and Monday in snowfall and high wind speeds. Students were granted a snow day on Monday, which had evolved into “blizzard” conditions. In some parts of Maine, an astounding forty inches fell. The high wind and blistering sleet confined many students to their residence halls, and a common complaint heard on campus was the closure of food delivery services due to the storm. Husson University was blanketed in two feet of snow, completely covering the walkways and footpaths on campus. Valentine’s Day saw a delay until noon to see the snow somewhat cleared for students and staff to safely make it to their classes.